To find such features on a starter amp 10 years ago would have been pretty incredible; today, it's seemingly the norm. Despite stiff competition, the Stereo 20 can carve its niche a little deeper. Surprising range and quality of tones. Comprehensive features for a very reasonable price. High gain leads fizz a little. Blackstar's new ID:Core Stereo 20 combo aims to exceed the expectations of a typical practice amp. Behind the grille cloth it features two 10-watt, four-inch loudspeakers hooked up to a stereo output stage. 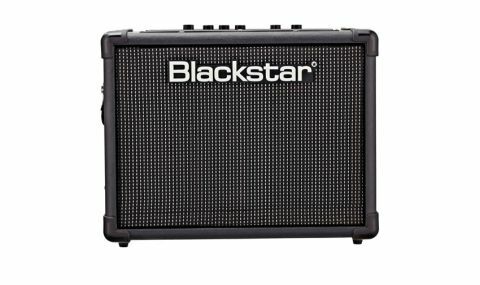 Powering them is a stripped-down version of Blackstar's popular ID: preamp and it's all contained in a smart-looking cabinet with an integral carry strap. "A six-position voicing switch accesses two clean sounds, crunch, super crunch and the well-known OD1 and OD2 lead sounds"
A six-position voicing switch accesses two clean sounds, crunch, super crunch and the well-known OD1 and OD2 lead sounds. There are controls for gain and volume, together with a single EQ knob that features Blackstar's patented ISF control, which continuously shifts the EQ response from USA to British, emphasising treble and bass in one direction and warm mids in the other. Effects are taken care of by buttons for modulation, delay and reverb, combined with a rotary selector that offers four variations for each effect type, and a level control. The Core models are programmable, with one patch per voice setting capable of being saved on the amp, but more if you use the optional FS-11 external foot controller or Blackstar's Insider software, via the USB socket. There's a tap-tempo button for manually setting delay times and a manual mode button, which takes the Core into 'what you see is what you get' mode. Also lurking in the software is a built-in tuner, accessed by pressing the tap and manual buttons simultaneously. Last, but by no means least, are two 3.5mm jack sockets for line in and speaker- emulated line out/headphone functions. All these electronics lurk just behind the moulded plastic control panel, which also doubles as a chassis for the two small printed circuit boards that hold the majority of the Core's components. Despite the budget construction, the quality is still there where it counts and the assembly is certainly robust enough to cope with a knock or two. Even at this low price, the sounds are what matter - and the Core amp manages the trick of pulling big tones from a small box very well. Okay, the lead tones are a little fizzy at higher gain settings, although this can be softened using the reverb and EQ controls with a little care. "Even with a regular-output Strat, there's more than enough gain to create some serious rock and metal tones"
Even with a regular-output Strat, there's more than enough gain to create some serious rock and metal tones with the OD1 and OD2 voicings, which cover aggressive bite and thick, warm midrange punch. The crunch and super crunch voices offer more versatility than a single crunch sound, with snarl and bite in abundance to cover all your favourite classic rock and blues stuff, while the warm and bright clean options provide the perfect complement for rich natural-sounding chords. The stereo effects are treated cleverly to create the illusion of increased width, as though the speakers are either side of your head instead of side-by-side in a small box. Depending on the effect choice and setting, the super-wide effect varies in intensity, but sounds impressive all the time. And that's not all: the updated version of Blackstar's Insider software is another great reason for buying an ID: amp - as well as offering patch storage, direct recording and pinpoint control of the amp's effects, it's a passport to a whole community of users, who love posting patches and discussing what can be done with them. One other very cool feature is re-amping, which allows you to take a dry un-effected guitar sound, process it through the Core's preamp, and then send it back into your DAW.